One of the issues that are not being addressed in the Sandoval County Ordinance is the degradation of roadways. This is a big issue in the county since the City and County conservative council and commission screwed up on bonds and set road repair back 10 years. Our roads and bridges are crumbling. The Sandoval County Commission has passed the burden on to the taxpayers with the sitting of heavy industrialization of fracking and oil drilling in Rio Rancho Estates and throughout the Albuquerque Basin. On Thursday Evening Nov. 29th 6 pm at the Sandoval County Admin. Bldg 3rd-floor chambers on 1500 Idalia Bernalillo NM 87004 Please make your voice heard. The hatchet job of a bad ordinance has been published and this is the first public comment on the issues present in the 2018 version of the “Stoddard” oil and gas – an industry-written ordinance. The siting of over 1000 wells in Rio Rancho Estates means degradation of impacts and risks with no accountability from the County in the ordinance. There has been no cost-benefit analysis done on infrastructure degradation, or water use, where the water is coming from and if the county plans to sell water to fracking operators while allowing increased emission and health degradation to the citizens of Sandoval County. (Rio Rancho Source Water Protection Plan shows a baseline of the water issues in Rio Rancho Northern and Encinos well collapsed and is being redrilled for $$$ big bucks yet the City is silent on Planning Director David Heil and County Commissioner who made the floor amendment allowance for Thrust Energy and AMREP to profit.) Again the County Commission passed the buck to taxpayers to pick up the tab. See CGR Homepage for contact info and where to submit comments online and to the commissioners. The following is a reprint of the degradation that comes with heavy industrialization. Rio Rancho Estates Master Plan (Map of Area enclosed) was zoned Rural Residential when people bought their property. Now there is a big change without the transparency to residents of Rio Rancho and Rio Rancho Estates and the Abq basin potential risk to health and environment with literally no accountability. Fracturing Regulation Act, by a vote of 52-3, the day after it passed the House by a vote of 108-9. The passage of this bill, signed by Governor Pat Quinn into law on June 17, 2013, will open the doors to massive fracking industrialization of Southern Illinois once regulations and the regulatory infrastructure are in place. Illinois have been frequently highlighted by the oil & gas industry, Illinois politicians, and mainstream media (jobs, lease fees, severance tax revenues, energy independence, etc. ), the potential negative impacts of mass fracking industrialization on Southern Illinois have been at best de-emphasized, and at worst completely denied. This politically facilitated industry-driven initiative does not particularly have popular public support either in Southern Illinois, with 40.7% supporting it, 39.7% opposed, and 19.6% no opinion (Leonard, 2013) or nationwide, with 44% favoring increased fracking and 49% being opposed. In the six-month period from March to September, 2013 public opposition to fracking grew by 11% (Pew Research Center, 2013). This shift is at least in part due to increased public awareness of the many potential negative impacts that accompany mass fracking industrialization, which include (but are not limited to): air pollution due to methane leakage and industrial equipment operation; water contamination from methane migration and leaks, spills and intentional dumping of frack fluid; toxic and radioactive fracking flowback and produced water; fracking wastewater disposal induced earthquakes; infrastructure destruction and roadway degradation; increased greenhouse gas emissions; habitat segmentation and ecosystem degradation;permanent destruction of water; social ills including increased crime, drugs,prostitution, homelessness; and the most dangerous workplace in the United States. Though readily monetizable, general efforts to attach price tags to these various economic, environmental and social ills have lagged immensely behind efforts to project potential revenues from mass fracking industrialization. However, several state departments of transportation have more recently raised important concerns regarding damage to infrastructure, and roadway degradation in particular, due to the immense drilling and fracking-related truck traffic. 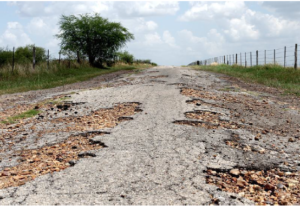 The issue of roadway degradation touches upon a number of extremely important public interests, including economic concerns (are taxpayers responsible for road repairs and reconstruction in generally rural counties with relatively small road budgets? ), safety concerns (dangerous degraded roadway and bridge conditions, along with an increasing gravelization of rural U.S.) and quality of life concerns (dust, traffic, noise and air pollution). As mass fracking industrialization continues to proliferate around the United States, these concerns are starting to become more and more of an issue nationwide. The most comprehensive list of total HVHF (fracking) wells by the state has been compiled by Ridlington and Rumpler (2013), who found that between 2005 and 2012 more than 82,000 fracking wells were drilled or permitted in 17 states, with 22,326 fracking wells being drilled in 2012, 13,540 of which were drilled in Texas. Current industry plans for continued mass fracking industrialization nationwide includes the drilling of one to two million wells over the next 10 to 20 years, with production at each well running for approximately 30 years. Estimated total projected wells for individual states include 100,000 in Pennsylvania (Yeoman, 2013), 50,000 in North Dakota (Scheyder, 2013), and 40,000 for the State of New York (Kennedy & Gallay, 2012). In terms of total fracking wells already drilled, Texas has more than 33,000 wells, followed by Colorado with in excess of 18,000, and Pennsylvania with nearly 7,000 (Ridlington and Rumpler, 2013). The cause of the greatest harm is not particularly the high volume hydraulic fracturing (HVHF) or fracking technology itself, as it is the scale of industrialization required to engage in this form of fossil fuel extraction. As Columbia University’s Dr. Anthony Ingraffea relates, the problem with shale gas and oil is that it is fundamentally distributed everywhere equally throughout a shale play, which means that the industry has to drill everywhere to access it. Everywhere can mean a five to fifteen-acre drilling pad, with each one supporting six to twelve wells and spacing of one well for every 40 (in the Marcellus Shale Play) to 65-acre (in the Eagle Ford Shale Play) area in a given county to be fracked. With the industry standard of fracking 70% of targeted counties, individual rural counties in southeastern Illinois in the sweet spot of the New Albany Shale Play could conservatively be looking at upwards of 3,500 wells each. This total is based upon one well for every 65-acres, clustered in 6- well-drilling pads over 70% of a county, with an average of 14 townships per county and each township averaging 36 square miles in area (Podulka & Podulka, 2010). The amount of truck traffic required to service each individual fracking well is immense. Podulka and Podulka (2010) estimate that it takes between 1,760 and 1,904 truck trips hauling equipment, materials, and water to build, drill and high volume hydraulically fracture a single well. A typical Marcellus fracked well requires 5.6 millions gallons of water during the hydraulic fracturing of the shale, of which approximately half returns to the surface as flowback and produced wastewater, which is summarily shipped away in tanker trucks to disposal wells. Currently, more than 95% of fracking wastewater produced in the United States is injected into deep disposal wells (Clark and Veil, 2009). Moss (2008) estimates that it can require more than 3,000 truck trips to bring water to and remove waste from a single typical fracking well, with an additional 220 to 364 trips being necessary for hauling equipment, materials, and employees. The New York State Department of Transportation (2011) found that while the drilling phase can require 290 truck trips over a 28 day period, due to total water and waste needs the hydraulic fracturing of a single well can require more than 2,300 truck trips in just a 3 day period. The New York State Department of Environmental Conservation [NYDEC] estimates a single well requires 1,800 to 2,600 total truck drive-bys (truck trips) through all phases, with an 8 well site requiring 14,400 to 20,800 total truck trips. A comprehensive study prepared by Underbrink (2012) for the DeWitt County Texas Commissioners utilized Equivalent Axle Load Factors (EALF), roughly equivalent to both a truck trip and an Equivalent Single Axle Load (ESAL), to define traffic demand in the Eagle Ford Shale region. A typical country road will last about twenty years when being subjected to about 500 EALF’s per year, requiring reconstruction after a total of 10,000 EALF’s. Underbrink estimates that the total EALF’s in the first year of a single fracking well’s development and production is 2,430, with annual EALF total of 1,250 thereafter, for a total of 26,680 for one single well in production over 20 years. The New York State of Transportation estimated that the total road maintenance costs to mitigate impacts from truck traffic to 40,000 proposed wells across New York State would total as much as $378 million annually. This total is based upon state roads having an estimated cost between $90 million and $156 million per year, and local roads and bridges having an estimated cost between $121 million to $222 million per year (Barth, 2013; Kennedy and Gallay, 2012; New York State Department of Transportation, 2011). Arkansas estimates that the costs from road damage due to fracking truck traffic are $450 million, finding that roads designed to last 20 years require major repairs after only 5 years due to fracking’s constant stream of overweight vehicles ferrying water and equipment to and from well sites (Heinberg, 2013; Rogers, 2013). According to David Flynn, the Director of the University of North Dakota Bureau of Business and Economic Research, North Dakota allocated nearly $1 billion for infrastructure, primarily for roads damaged by heavy energy-related truck traffic (Gunderson, 2012; White, 2013). Alan Dybing, a researcher at the Upper Great Plains Transportation Institute, states, “Simply put, the roads are falling apart in many cases,” as each new well requires more than 2,000 truck trips, and the massive trucking rigs are demolishing the state’s roadways (Holeywell, 2011). Pennsylvania Department of Transportation officials reported that in 2010 more than $265 million was needed to repair roads damaged due to Marcellus Shale drilling (Christie, 2010; Dutzik et al., 2012). Additionally, state officials reported that as their rural roads were not designed to withstand the volume or weight of the level of truck traffic, they have sometimes been degraded into impassability (Randall, 2010). By 2013, the state estimated that it would cost $3.5 billion just to maintain the states existing roadway assets, and an additional $8.7 billion for necessary bridge repairs (Rogers, 2013), with fewer than 7,000 existing wells. An engineering study from the Eagle Ford Shale Task Force regarding anticipated fracking-related truck traffic in DeWitt county Texas indicated that with an estimated 3,250 wells that will be accessed by county roads, the total cost for DeWitt County to provide a road system (331 miles) to meet projected industry and public needs would be approximately $432 million, or almost $133,000 per well (Underbrink, 2012). The Texas Department of Transportation [TDOT] has estimated that the cost of maintaining the roadway infrastructure degraded by the fracking traffic statewide is $4 billion a year (Heinberg, 2013; Rogers, 2013). That includes $1 billion for farm-to-market roads, $1 billion for local roads, and $2 billion for interstate and state highways (Barth, 2013). TDOT additionally estimates that $2 billion of that total is road damages to the East Ford Shale region of South Texas alone (Remington, 2013). Due to the overwhelming extent and expense of the destruction in that area, the TDOT plans to convert at least 83 miles of asphalt roads into gravel roads in those areas experiencing increased fracking-related truck traffic (Batheja, 2013). Barth, J. M. (2013). The Economic Impact of Shale Gas Development on State and Local Economies: Benefits, Costs, and Uncertainties. NEW SOLUTIONS: AJournal of Environmental and Occupational Health Policy, 23(1), 85-101. Batheja, A. (2013). Cash for Road Repair in Shale Areas Proves Elusive. The Texas Tribune. April, 26. Clark, C., & J. Veil (2009), Produced water volumes and management practices in the United States. Rep. ANL/EVS/R-09/1, Argonne National Laboratory. Dutzik, T., Ridlington, E., & Rumpler, J. (2012). The Costs of Fracking: The Price Tag of Dirty Drilling’s Environmental Damage. Penn Environment Research & Policy Center, Fall. Kennedy Jr., R.F., & Gallay, P. (2012). Letter: The Costs of Fracking. New YorkTimes. April, 2. Retrieved from http://www.nytimes.com/2012/04/03/opinion/the-costs-of-fracking.html. Moss, K. (2008). Potential Development of the Natural Gas Resources in the Marcellus Shale: New York, Pennsylvania, West Virginia, and Ohio. Denver, CO. National Park Service, US Department of the Interior, Geologic Resources Division. Podulka, S.G, & Podulka, W.J. (2010). Comments on the Science Advisory Board’s 5/19/2010 Draft Committee Report on the EPA’s Research Scoping Document Related to Hydraulic Fracturing (“Report”). Randall, C.J. (2010). Hammer Down: A Guide to Protecting Local Roads Impacted by Shale Gas Drilling. Working Paper Series: A Comprehensive Economic Impact Analysis of Natural Gas Extraction in the Marcellus Shale. December. Underbrink, D. (2012). Road Damage Cost Allocation Study. Prepared for the DeWitt County (Texas) Commissioners Court. Naismith Engineering. June, 27. White, N. E. (2013). A Tale of Two Shale Plays. 2012 SRSA Fellows Address. The Review of Regional Studies, 42(2), 107-119. Rio Rancho Estates Master plan Maps of the Rio Rancho Estates Master Plan.